Music is the best friend ONE has (yes in this case too ONE is ME), the songs and tunes to suit every mood, to heal every wound, to feel every emotion. It describes love as well as rage and often found as the best analogy to define sadness. In my life I have been greatly influenced by music, all thanks to very important people in my life who have helped me explore the various facets and faces music has. Early childhood was ruled by the radio these were the pre – FM days, i remember waking at 7.30 am to the sounds of “Finolex pipes ads” that ran on the Vividh Bharathi. The “Cibaca Geetmala” presented by Ameen Sayani was where my early education of film music began. These were the days when Hindi songs were just Hindi songs and not Bollywood numbers. The title track of the movie used to be more popular than the ITEM numbers. So I caught on to the bug of Filmi Gaane and soon began following the likes of Rafi, Asha, Lata, Kishore, Manna Dey, Hemant Kumar et all. In our house these names were taken as though all of them almost lived with us. Since downloading was not an option at that time and buying HMV LP records was still a rich mans muse, we had tons of cassettes on which songs were recorded from other cassettes often borrowed from friends and acquaintances. I owe a lot to my father for nurturing music in me. Although I have not become a singer or a musician myself, I have learnt to appreciate music. Slowly I graduated to the more serious phase of Ghazals, although the Urdu language was new and alien to me, the soft sounds and grandeur that I felt in pronunciation attracted me. Soon I was on a spree of Jagjit Singh, Chitra Singh, Pankaj Udhas,Ghulam Ali etc. I remember how startled my mother was when i asked her what was the meaning of “Paimana” !!! Music was the reason I was attracted to learning different languages and understanding their meanings. Micheal Jackson was someone who my brother always listened to on the player. What this person looked like in real life and what the MOONWALK was, I saw only when satellite television was available in India. Just like MJ there were many other talented folk who made some awesome English music, so early school years were dominated by Micheal Jackson, George Michael, Madonna, Phil Collins, Billy Joel and the likes. Most of them were just names I didnt know much about them except for MJ he was a phenomena. Soon the Vividh Bharathi was replaced by sounds of rock, when my brother decided to literally bring the house down with Metallica, Nirvana, Pink Floyd and U2, Dire Straits. I was too young to understand that music then, most of it was pure noise (pardon me), just like morning prayers my brother had taken it quite seriously to educate all of us with Alternate Rock, Heavy Metal etc. My mother being the most defiant student amongst us all. No one could stop her when she decided to do some head banging, the head in this case my Brother :). I thank my bro entirely for introducing me to this genre very early on, there have been some really fun times we had.Through the whole girlie phase of life, it was the boybands that rocked my life, so BOYZONE, BACKSTREET BOYS, N’SYNC, WESTLIFE and of course PETER ANDRE and Enrique. MTV and FM radio had made an entrance and now a 24 hour non stop dedicated channel to music available to watch not just listen. I got a chance to be introduced to many other forms of world music like RAP, JAZZ, COUNTRY but my first love still remains ROCK. My mother has been largely responsible for installing the radio in me, She always had the radio on in her kitchen and she she gleefully shifted among the shortwave frequencies. Old hindi and marathi songs, including BhavGeet I absorbed were thanks to her. Many a afternoon were spent with me returning from school to play Antakshari with her, and this was our favorite pass time on nights when electricity went off. This habit rubbed off me well, those graduation years of late night studies were made more interesting with radio by my side, I almost looked forward to that solitude time of studying and music. Music is and will remain an integral part of my life. Many a dates and dinner conversations have gone by with Adi trying to explain the fineries of Hindustani Classical music to me. I knew from early on that the person i share my life with has to be someone who shares an equal interest in music, little did i know then that this person would also be a talented musician himself. 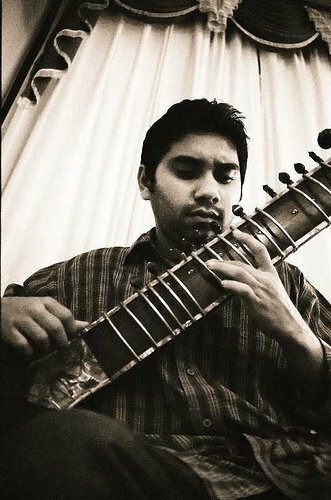 my first encounter with Adi was in our college when he was participating for a college competition, all geared up in traditional batik kurta, calm and composed, deep in thought with his muse, Emily (the Sitar). I knew it the first time I laid eyes on him that he was the ONE, we later found that the ONE he was in many other ways also. i always liked and listened to classical music, but was not so closely associated with it. Most of the years all festive mornings began with Shehnai from Bismillah Khan or to the sounds of bhajans and abhangs of Bhimsen Joshi, all that passive learning and liking, I had finally found someone who could share my interests. Strangely, my close friends too are like me, who listen to appreciate music in all its forms. 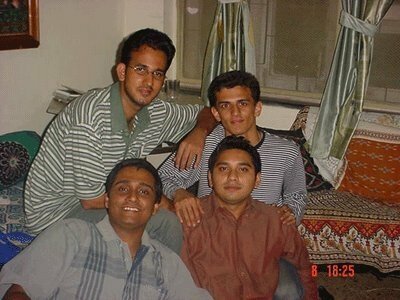 Better part of college life was spent outside of college (nothing new about that), with these blokes, Rajesh, Barve, Raju and Adie dressing up for Exodus – their fusion band. 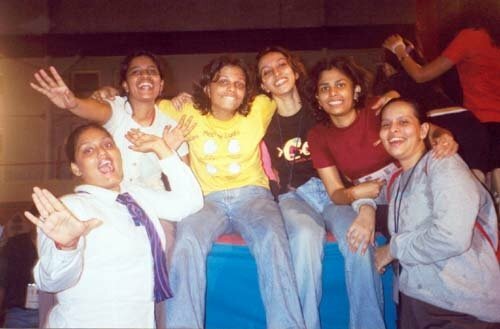 And my friend Pallavi and myself almost did a Phd in Antakshari during our college fest – Utsav. Music was among the many other things we all got a bit high on. Walkman’s and discman’s in our college days were a rage, pretty much like the MP3 players and Ipods are now. Countless amount of songs and CD’s had been exchanged amongst all of us, it was the advent of Internet and PCs in homes and we all made sure to make use of all our resources adequately well!! Thankfully I have also got married into a family which not only appreciates but lives and breathes music. It is defiant correct to say that music runs in the family, and I am now part of it.